The Harriers will be welcoming Eastbourne Borough to Aggborough tomorrow for their first ever visit to us. We'll also be welcoming Chris McPhee to the club for what could be his first game, ironically Boro is his hometown club. 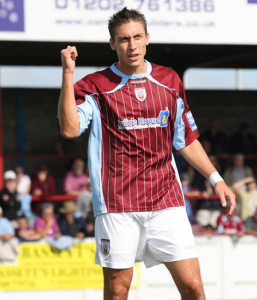 Chris signed for us yesterday after leaving troubled Weymouth last week just before their infamous 9-0 defeat to the hands of Rushden and we'll be looking at him to help re-instigate our fight for a play-off place A place that has been drifting away from us in recent weeks. Russ Penn will still not be available to us but he did start to make his comeback from injury in last nights 3-0 win at Stourbridge in the WSC. We have no other injuries and following the long enforced lay off since we disgracefully lost at home to Cambridge then everyone should be raring to go and eager for a win. Eastbourne are new to this League and after an iffey start they now seem to be finding their feet Histon stylee. They won't get much higher than mid-table this term but could make more of an impression next time. Just as Histon have. No team news from Boro yet. Bartlett, Coleman, L Baker, Riley, C Armstrong, Lowe, Ferrell, Creighton, Carr, Jones, Knights, Foley, McDermott, Bennett, Hayward, Brittain, McPhee, Barnes-Homer, Smikle, Richards, Moore. Jordan, Hook, Lightwood, Mingle, Gargan, D Baker, Jenkins, Smart, Austin, Pullan, Harding, P Armstrong, Atkin, M Crabb, Ballard, Lovett, N Crabb, S Crabb, Wormull, Treleaven, Douglas, Brown, Smith, Budd, Johnson, Lok, Barden, Patton.